The Acura NSX GT3s of RealTime Racing debuted in solid fashion this weekend, earning a pair of top-10 finishes as the 2017 Pirelli World Challenge season opened at St. Petersburg, Florida with a pair of events. 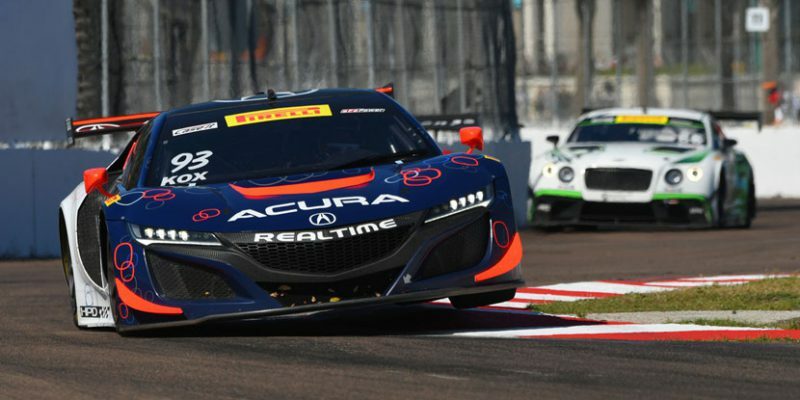 The weekend was a study in perseverance for both Ryan Eversley and Peter Kox as both drivers battled through misfortune that prevented their weekends from being resounding successes. Eversley fought back from a Thursday crash that left him last on the starting grid for Saturday’s opener and rebounded for a ninth-place run on Sunday. Meanwhile Kox powered his Acura NSX GT3 from 14th to eighth in Saturday’s opener but saw his Sunday end after just three turns with a broken radiator. Eversley started shotgun on the 24-car field in Saturday’s race, as his practice crash left him unable to qualify, but he gained six spots before residual damage from the accident sidelined him with six laps to go. A fast lap time during Saturday’s race earned him the seventh grid spot for the second race of the weekend, and he ran in the top 10 all day before settling for ninth. Kox’s weekend went in the opposite order from his teammate. The native of the Netherlands started 14th in the opener and climbed into the top 10 by the race’s halfway point. After a couple of late retirements, Kox had gained six spots to finish eighth and earn the race’s Hard Charger Award. Unfortunately the joy was short-lived and Sunday’s race ended before the end of the first lap when he suffered a punctured radiator, leaving him to finish 24th. The Pirelli World Challenge will next do battle on the streets of Long Beach April 7-9, running the year’s third round on Sunday afternoon. The Acura NSX GT3 racecar utilizes the production NSX’s lightweight multi-material body with aluminum-intensive space frame, and is powered by a 3.5-liter, 75-degree, twin-turbocharged DOHC V-6 engine. The engine uses the same design specifications as the production 2017 Acura NSX, including the block, heads, valve train, crankshaft, pistons and dry-sump lubrication system. The engine is paired with a 6-speed, sequential-shift racing gearbox, delivering power to the rear wheels. The Acura NSX is produced at the Performance Manufacturing Center in Ohio. Video recaps from this weekend’s Acura Pirelli World Challenge racing activities at St. Petersburg are being posted on the “Honda Racing/HPD” YouTube channel. Produced by the Carolinas Production Group, the video packages can be found in the 2017 HPD Trackside Video Playlist at: https://www.youtube.com/HondaRacingHPDTV. 3 Patrick Long Wright Motorsports Porsche GT3R + 10.379 sec. 8 Peter Kox RealTime Racing Acura NSX GT3 + 14.489 sec. 2 Johnny O’Connell Cadillac Racing Cadillac ATS-VR + 1.475 sec. 3 Alex Riberas Ferri Motorsport Ferrari 488 + 2.459 sec.